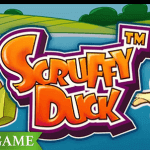 Play Scruffy Duck for real! Once upon a time, there was a very ugly duck that didn’t fit the other ducks. It’s a pitiful sight to see the scruffy duck suffering, simply because he doesn’t look like the others. A story that will appeal to many, recognising themselves or others, knowing this sad story often happens in real life too. No wonder NetEnt choose to bring this old story back to life on the reels, and we can only hope that all of these stories end up as cheerful as the fair-ytale in which the little scruffy duck matures into a beautiful swan, the most beautiful of them all.It’s one of the best-loved tales, one that can’t be missed among the many NetEnt slot themes. While the story was published for the first time in November 1843 by the Danish author Hans Christian Andersen, it has been reprinted all around the world. Over the years, the tale has been adapted to a variety of media, including radio and television. It was in May 2017 that another type of media could have been added to this list if the Scruffy Duck™ slot was originally called The Ugly Duckling, but it wasn’t. Luckily, it doesn’t matter for you as a player as you’re offered a feel-good video slot anyway in which you will see the scruffy duck turn into a beautiful swan over and over again. Set in a pond, you’ll have a jump in the water as soon as you open the Scruffy Duck™ slot at one of the NetEnt Casinos. Surrounded by lilies and frogs, you’ll find five reels covered with either ducks or letters. Among the ducks, you’ll find some very cool ones and one outsider known as the ugly duckling. Unlike it’s the case in The Ugly Duckling, this little scruffy duck seems happy on the reels. Especially in the role of Expanding Wild which can appear on any reel at any moment after which the little scruffy duck will turn into a beautiful swan. While inspired by a fairytale, the Scruffy Duck™ slot doesn’t look anything like the other fairytale-themed slots like Jack and the Beanstalk™, Red Riding Hood™, or the Hansel and Gretel™ slot which was launched only 2,5 weeks before Scruffy Duck™. The Scruffy Duck™ slot is definitely less enchanting than the other fairytale-themed Ne-tEnt slots, without any witches, stepmothers or fairies present on the reels. 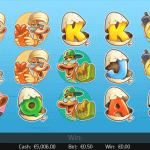 Cartoonish-styled, the Scruffy Duck™ slot is completely different bringing a fun and friendly atmos-phere in which you can expect bright colours and a jolly type of music. Offering the maximum bet available in a NetEnt video slot, this game might attract some high-rollers, though the game will be attractive to any type of players with bets going from 0.25 to 250.00. A wide range of bets are available in the Scruffy Duck™ slot thanks to the 10 bet levels and seven different coin values. Try different combinations just until you’ve found yourself the perfect bet of which you believe it brings you the best of luck. 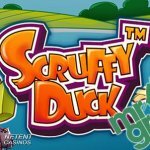 The Scruffy Duck™ slot won’t be found on my list of the best-designed NetEnt slots, but it still has enough to offer thanks to some great slot features including Stacked Symbols, the Expanding Wild, Free Spins linked to another five different slot features. Stacked symbols will be seen a lot while playing the Scruffy Duck™ slot and will be availa-ble during the Main Game, as well as Free Spins. Stacked symbols can appear fully or par-tially on the reels. The Expanding Wild will be of big importance in the Scruffy Duck™ slot. Available in the Main Game and during Free Spins, you better like this type of slot feature as it can’t be ignored. But how can you dislike a certain slot feature anyway, responsible for many extra wins? No matter when or where it appears, as long as it’s going to be involved in a winning combination it will expand over the entire reel where it will substitute for any other sym-bol except the Free Spins symbol. Another great slot feature that perfectly fits this fairytale-themed NetEnt slot is the Free Spins feature activated when three Free Spins symbols appear anywhere on the reels 3, 4, and 5. if so, be aware of the five flying ducks jumping into the water for a refreshing swim in the pound. Once landed safely, though upside down, it’s up to you to pick one of the ducks determining how many free spins you’ll be awarded and what slot feature will be involved. The number of Free Spins will be between 6 and 15 while either the Multiplier feature, Symbol Removal feature, Colossal Wild, Random Wilds or Double feature will be activat-ed.